You will never buy store bought again. 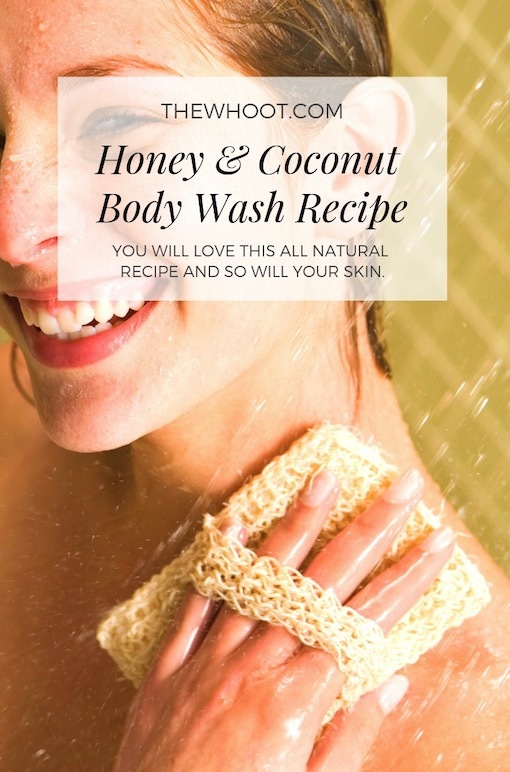 Save money and toxic exposure and make your own Honey Coconut Body Wash. We have a video tutorial to show you how. Your Skin is your largest organ and we subject it to all sorts of dangerous chemicals daily. It starts in the shower with shampoo and body wash and then extends to the lotions and potions. Only recently we shared a post that outlined the dangerous ingredients that are lurking in everyday beauty products. To say that the findings were astonishing is an understatement! As Dr. Mercola says, if you can’t pronounce the ingredients, they are not likely to be good for you. This infographic whilst confronting, is educational. It helps you to make better buying decisions. Continue on scrolling to learn how to make your own natural body wash.
After reading the article, we became inspired to find an alternative to shop bought body wash and we believe that we have found it. Honeysuckle is the creator behind this Honey and Coconut Body Wash and we were excited to see just how easy it is to create. You can use any essential oil you like, it’s a personal choice however Honeysuckle uses Orange as she wants a citrusy result. She also says that rose and lavender are more luxurious. She also says that when it comes to the honey you should ensure that the label says “raw,” “unpasteurized,” or “unfiltered”. Raw honey will gently remove dirt and impurities without stripping the skin of natural oils. The coconut oil acts as Skin softener and has moisturizing effects that will help heal dry skin. Be sure to use extra virgin, organic oil. Make sure that the label doesn’t say “hydrogenated, refined, or bleached” in any way. She also recommends Dr. Bronner’s Unscented Baby-Mild Castile Liquid Soap because it contains no fragrance and has olive oil. Castile soap will give this body wash that sudsi-ness. It’s a natural soap that’s made with vegetable oils.